Produced for Melodee Music in Sterling, Virginia. Perhaps the world's largest bridge pin! The bridge pin for this sign, measuring 3 feet tall and 11 inches wide at the top, was created by Red Oak Hollow Turning. 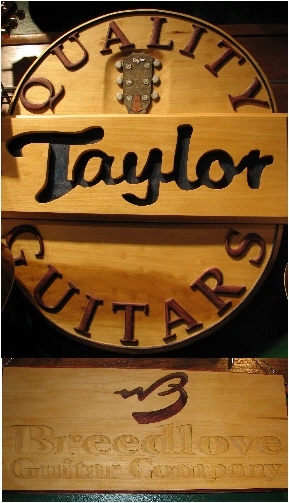 The sign, which I created, has a mechanically rotating base with matching acoustic guitar bridge sides. The entire sign measures 36" wide by 48" tall. Needless to say, it attracts plenty of attention at events and trade shows. 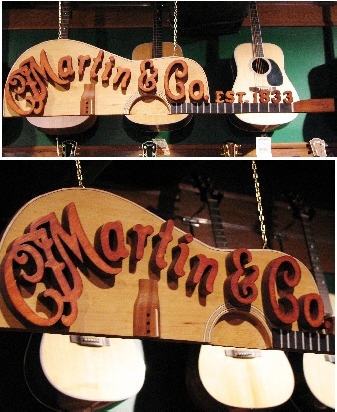 These two signs were created for Melodee Music in Sterling, Virginia and hang in the acoustic guitar room. Custom signs are available on a per-item, quote basis. My friend, Jim Warwick, had a guitar body that he was going to dispose of. One man's trash is another man's treasure. I took this as an opportunity to make him a sign for his workshop. 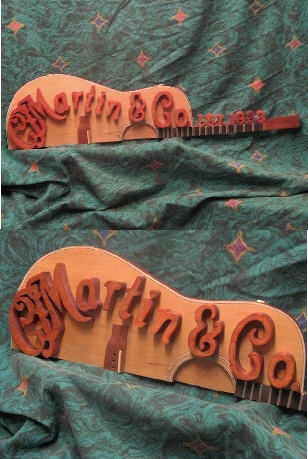 The guitar is Flamed Maple with Cedar lining and the lettering is Flamed Maple and Rosewood.